This touching story of a little boy's last wish is taken from the book Chicken Soup for the Soul. The book is filled with wonderfully inspirational stories, but this one is extra special. And best of all, it's true! 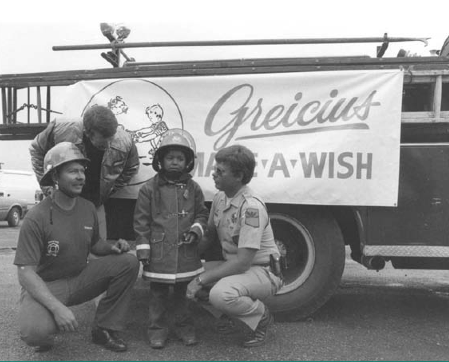 Click on the link at the bottom of this page to verify the story and learn more about how this little boy became the very first recipient of the now famous Make-A-Wish Foundation. May we all remember how precious life is, and how special the moment of death can be. The 26-year-old mother stared down at her son who was dying of terminal leukemia. Although her heart was filled with sadness, she also had a strong feeling of determination. Like any parent she wanted her son to grow up and fulfill all his dreams. Now that was no longer possible. The leukemia would see to that. But she still wanted her son's dreams to come true. She took her son's hand and asked, "Bopsy, did you ever think about what you wanted to be once you grew up? Did you ever dream and wish what you would do with your life?" "Mommy, I always wanted to be a fireman when I grew up." Mom smiled back and said, "Let's see if we can make your wish come true." Later that day she went to her local fire department in Phoenix, Arizona, where she met Fireman Bob, who had a heart as big as Phoenix. She explained her son's final wish and asked if it might be possible to give her six-year-old son a ride around the block on a fire engine. Fireman Bob said, "Look, we can do better than that. If you'll have your son ready at seven o'clock Wednesday morning, we'll make him an honorary fireman for the whole day. He can come down to the fire station, eat with us, go out on all the fire calls, the whole nine yards! "And if you'll give us his sizes, we'll get a real fire uniform for him, with a real fire hat -- not a toy one -- with the emblem of the Phoenix Fire Department on it, a yellow slicker like we wear and rubber boots. They're all manufactured right here in Phoenix, so we can get them fast." Three days later Fireman Bob picked up Bopsy, dressed him in his fire uniform and escorted him from his hospital bed to the waiting hook and ladder truck. Bopsy got to sit on the back of the truck and help steer it back to the fire station. He was in heaven. There were three fire calls in Phoenix that day and Bopsy got to go out on all three calls. He rode in the different fire engines, the paramedic's van, and even the fire chief's car. He was also videotaped for the local news program. Having his dream come true, with all the love and attention that was lavished upon him, so deeply touched Bopsy that he lived three months longer than any doctor thought possible. Yet finally, one night all of his vital signs began to drop dramatically. The head nurse, who believed in the hospice concept that no one should die alone, began to call the family members to the hospital. Then she remembered the day Bopsy had spent as a fireman, so she called the Fire Chief and asked if it would be possible to send a fireman in uniform to the hospital to be with Bopsy as he made his transition. The chief replied, "We can do better than that. We'll be there in five minutes. Will you please do me a favor? When you hear the sirens screaming and see the lights flashing, will you announce over the PA system that there is not a fire? It's just the fire department coming to see one of its finest members one more time. And will you open the window to his room?" About five minutes later a hook and ladder truck arrived at the hospital, extended its ladder up to Bopsy's third floor open window and five firefighters climbed up the ladder to Bopsy's room. With his mother's permission, they hugged him and held him and told him how much they loved him. In one touching moment, Bopsy looked up at the fire chief and said, "Chief, am I really a fireman now?" "Yes, Bopsy, you are a fireman now," the chief said. With those words, Bopsy smiled and closed his eyes one last time. He passed away the next morning.